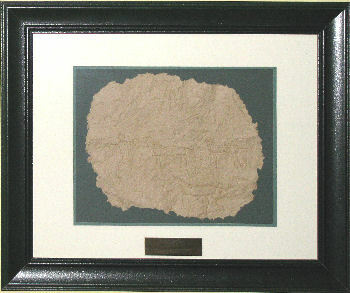 Buffalo Award from the Alberta Stewards Association for long term work in habitat preservation. From Central Alberta Regional Science Fair certificate of appreciation for long time support. For helping to initiate and continuing to support the annual Red Deer River Clean-up. From the Canadian Nature Federation for long time habitat stewardship, preservation and education. 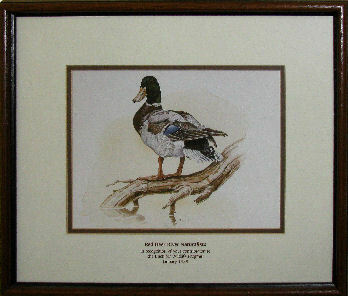 From Ducks Unlimited for assistance in habitat restoration. 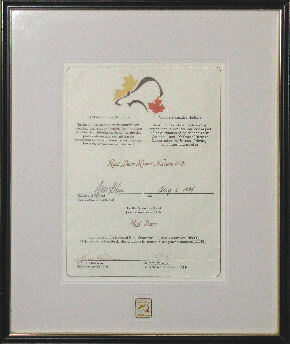 From Heritage Canada to recognize RDRN’s commitment to excellence in heritage preservation. 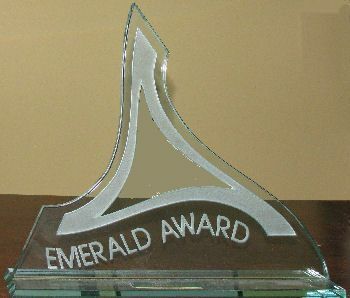 Emerald Award from the Province of Alberta to recognize 94 years of continuous effort to protect, preserve, and rehabilitate the environment. 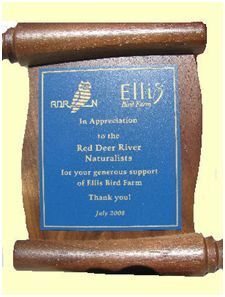 Since its creation in 1906, the Red Deer River Naturalists Society has been at the forefront of protecting and enhancing the environment. Through their efforts the Gaetz Lakes Sanctuary, a natural area within the City of Red Deer, was designated as a Dominion Bird Sanctuary in 1924. In 1980 the Society took the opportunity to enlarge the Sanctuary through the Urban Parks Program. 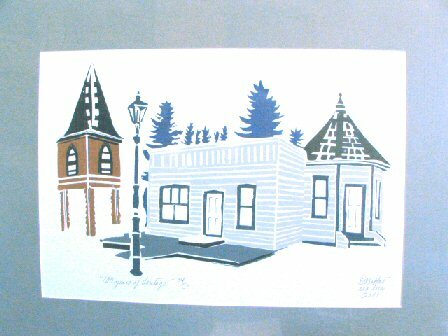 The strength of their advocacy resulted in the City of Red Deer expropriating land and creating an urban park system. The Kerry Wood Nature Centre opened in 1986 and welcomes 75,000 visitors annually. In 1987 the Society revived an Alberta Fish and game program used in the 1960’s – The Habitat Steward Program. The program was co-sponsored by AGT. Under this voluntary stewardship program any landowner who leaves at least 5 acres of land in a natural state can receive a Habitat Steward sign to publicly acknowledge their efforts. The program has grown to more than 1321 landowners and some 12,000 acres. RDRN has just released for sale a new book, NatureScape Alberta which is designed to increase wildlife habitat in backyards. From the Normandeau Society of Red Deer, November 16, 2004The RDRN have been instrumental in the establishment of the Sanctuary, and then serving as the guardians of the Sanctuary from 1924 until 1984, they lobbied long and hard and successfully to ensure that Waskasoo Park has a nature centre. They volunteer large numbers of hours in doing plant surveys and bird counts in the Sanctuary. The RDRN took a lead role in the Addition 2000 project (at the Kerry Wood Nature Centre) in ensuring that he construction was as “green” as possible, including photovoltaic (solar) power for their office and the KWNC library. They are also responsible for the groundbreaking grid-interconnected solar power system that demonstrates our and their commitment to the environment and reduces our operating costs. 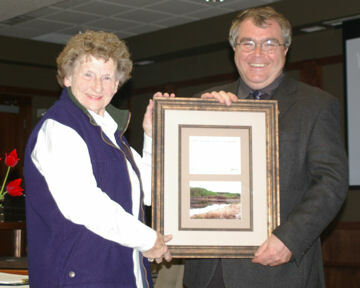 On behalf of RDRN, Dorothy Dickson receives the 2007 Red Deer Heritage Recognition Award from Michael Dawe. Innisfail Natural Area, a quarter section of land located 6 kilometres east of the town, was owned for many ears by Mr. Lewis who pastured a few cattle and lived in a log cabin on the site. Upon his death in 1973, the land was purchased by the Province of Alberta for the purpose of wilderness conservation. The area’s designation as a natural area became official under the Wilderness Areas Act in 1981. 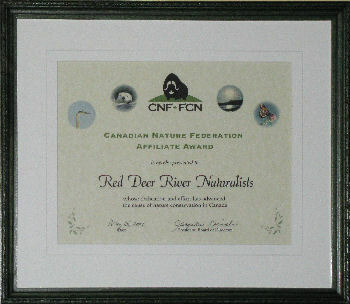 The Red Deer River Naturalists acted as the unofficial stewards until 1987 when the Volunteer Steward Program was instituted. Today, the Innisfail Natural Area is a biodiverse preserve used by members of the public seeking an outdoor experience.